It wasn't impressive, but the Bills won their season opener, 21-12, over the New York Jets. While Beyond the Playbook analyst Matt Sabuda gave credit to running back LeSean McCoy in leading the Bills, he also provided perspective on the Jets' poor play, calling it a "homecoming win over a jayvee team." Tyrod Taylor threw two touchdown passes and the new-look Bills beat the New York Jets 21-12 on Sunday in Sean McDermott's debut as Buffalo's coach. With the off-season departures of several significant contributors, the Buffalo Bills appear to be tearing away at a faulty foundation while selling the hope of building a better future. But all is not lost heading into Sunday's season opener. Analyst Matt Sabuda says the re-building Bills are stronger at this point than Sunday's opponent, the New York Jets, a team that has a large lead in their race to the bottom. He rose quickly through the ranks of the Buffalo Bills coaching staff this season and is believed by some to be a rising candidate for coaching possibilities elsewhere in the National Football League. 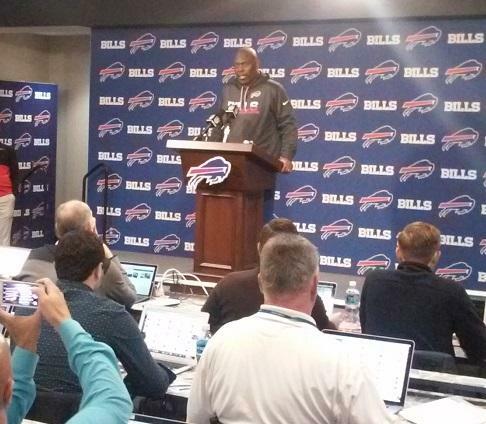 But Anthony Lynn, who was tapped yesterday to replace fired head coach Rex Ryan on an interim basis, says his only focus now is to prepare the Bills for their season finale this weekend. The New York Jets gained nearly 500 yards in offense in dominating the Buffalo Bills defense in a 37-31 win Thursday night. The effort provided a stark contrast from last Sunday when they held the Baltimore Ravens to just 13 points. "It's been one of the strangest, most disconnected first two games of any season," said analyst Matt Sabuda during WBFO's Beyond the Playbook. Matt Sabuda discusses the Bills Thursday night loss to the Jets during WBFO's Beyond the Playbook. A wild atmosphere is expected tonight as the Buffalo Bills host the New York Jets at New Era Field. Analyst Matt Sabuda believes the Bills can send their fans home happy tonight provided quarterback Tyrod Taylor improves upon his performance from Sunday's season-opening loss at Baltimore. Analyst Matt Sabuda discusses the Buffalo Bills prospects during WBFO's Beyond the Playbook. The Buffalo Bills will miss the playoffs for the 16th consecutive season. Still, analyst Matt Sabuda sees some intriguing storylines in Sunday's game against the New York Jets, notably, how the Jets' playoff prospects will be impacted by the game's result. The Bills' 22-17 victory over the New York Jets Thursday night was fueled by the production of their offensive backfield. On Friday morning's Beyond the Playbook, analyst Matt Sabuda says key performances were turned in by LeSean McCoy and Karlos Williams. The Buffalo Bills 33-17 win over the Miami Dolphins provided a much needed boost for fans as the Bills head into Thursday night's game against the New York Jets. Will Rex Ryan lead the Bills to the playoffs? The New York Jets are interviewing Doug Marrone, today. Courtesy of six turnovers from the New York Jets, the Buffalo Bills earned a 43-23 victory on Sunday. In this morning's "Beyond the Playbook," Matt Sabuda says the Bills allowed the Jets to stay in the game, but in the end they produced a big win on the road. With the Buffalo Bills visiting the New York Jets this Sunday, Matt Sabuda considers the rivalry that dates back to the original days of the American Football League.